I enjoy eating at In-N-Out Burger. The service is efficient, the food is high quality, and the menu is simple. When I eat there, it’s not difficult for me to choose what I want to eat – it’s usually a “double-double, animal style.” I also enjoy eating at The Cheesecake Factory, where much like In-N-Out, the service is efficient and the food of high quality, but the menu is far from simple. It’s a book of endless options. When I eat there, it’s not about choosing what to eat; it’s about deciding what to eat. So, is there a difference between making a choice and making a decision? Let’s start with definitions. A choice is a selection between two or more options. 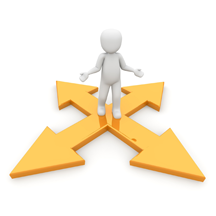 A choice can be made without much thought and is usually a result of our subconscious and a reflection of our values. A decision is a resolution or conclusion reached after consideration. Anyone who has been to In-N-Out knows that there is not a lot of consideration necessary to whittle down the options. While a decision about what to eat at The Cheesecake Factory requires careful analysis of a book of seemingly endless opportunity. It’s akin to figuring out what to watch on Netflix when friends and family visit. Though I do relish the opportunity to make the hard decisions, I prefer a simple menu with fewer choices after someone else has done a bulk of the analysis. I am of the mind that fewer options lead to better choices, fewer instances of plate envy, and a stronger commitment to the outcome. Think about the last time you reviewed a large menu at a restaurant or scanned Netflix looking for a movie. How long did it take for you to make a decision? Were you more satisfied with the decision than you would have been if choosing between prefiltered options? Burgers, cheesecake, and Netflix aside, the correlation remains the same in other situations. More options do not necessarily make for a better result. Two weeks ago, I was at peace with my decision to retire from the Navy. I had decided that I had done everything I had hoped to do in uniform (more than I dreamt possible) and that it was time for a completely different adventure. Then, I was presented with yet another amazing opportunity to extend my uniformed career. Quite honestly, it is the only job at my current rank that I get excited about doing, as it is aligned with my passions and strengths. It is an opportunity to build something new, enhance the lives of future Naval Officers, grow as a leader, and have an impact that should last for decades. All of which energize me a great deal. As I contemplated the choice in front of me, I felt as though I was next in line at In-N-Out and already tasting retirement (AKA that “double-double, animal style”). When suddenly I was teleported to The Cheesecake Factory where the menu wasn’t endless, but the pressure to rethink my order and the immediate future was, and remains, compelling. Don’t get me wrong, I don’t put in that level of thought when deciding between Thai Lettuce Rolls, Crusted Chicken Romano, or the Bang – Bang Chicken and Shrimp. And the decision between two amazing paths that represent the fork in the road at which I currently stand, is one that leaves me with no bad options. I recognize that I am extremely fortunate to find myself at such an intersection and once a path is chosen, there will be no regrets or looking back. But I am once again reminded that as simple as choices are to make, true decisions are extremely difficult. How many choices did you unknowingly make today? When is the last time you made an important decision? Do you see a difference between the two or am I just crazy? Great way to put it! Always enjoy your perspective! Cant wait to hear what you decide! I don’t think you’re crazy, but I think making a choice is the same as making a decision. Maybe with what you’re considering, there’s choosing a path, and then, for reals, signing papers. 🙂 That might validate the two-step choice/decision. In normal life without contracts, it seems choosing is it. Also, though, in normal life, a different thing can be chosen a while later. It’s not a longterm commitment. I make both, decisions and choices very fast. It was in watching you making this decision that I have made a choice to start slowing down and taking my time. Your ability to teach and lead is unlimited, in the Navy or out. You didn’t think they’d let you go that easy….. Being given the chance to help mold the future is almost an irresistible challenge. Someone in the Navy thinks that you still have something to give our junior personnel and they don’t want you to go, just yet. Whatever you decide, it will be the best for you, but if you leave, you’ll always wonder if you could have helped just one more junior officer or sailor become the next you. I think the list of points to consider is spot on, especially the one of consulting with others who may be impacted by the decision. This is especially relevant when a marriage is part of the equation. I heard a great piece of advice when contemplating furthering my military career (to the minimum retirement eligibility): the first 16 were for me and the last 4 for the wife. Being married to the right person makes life so much more rich and enjoyable, but failing to take into account the other person’s hopes and dreams injects friction and tension. This is especially true with military service. However, the decision must also make sense for you to where there are no regrets once the decision is made. Best of luck! (1) Your last tour needs to be a “what can I do for myself and my family” tour and not a “what can I do for the Navy”. The two are not mutually exclusive but you are preparing for your next career just like your commissioning source was supposed to prepare you for naval life. (2) Do not leave service without a TS/SCI (and polygraph if you can get it) for your last job. (3) Try not to be in a “signature authority” acquisition position in your last job. It complicates your being hired. (4) When you get out, you are always looking for your next position because job security is a thing of the past. No matter your performance you are always one contract or reorganization away from your separation package. (5) Your ability to shape things navy does not end when you retire if you don’t want it to. I have more influence now then I ever did even with 4 pentagon tours.